In part 1 of this series of articles, I explained the overarching idea of beaTunes, i.e. how analysis and inspection help you to build better playlists. 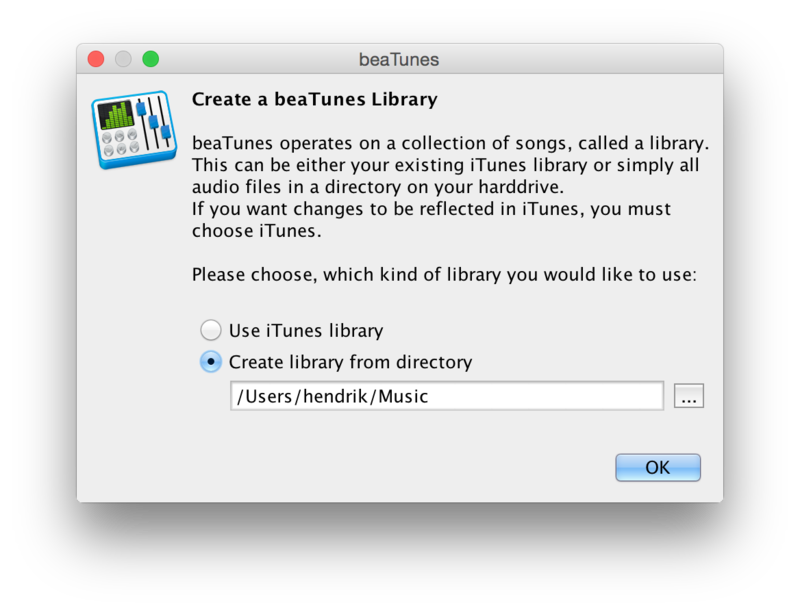 Today, I am going to concentrate on how to get started with beaTunes libraries. You can choose between a folder- and an iTunes-based library. No worries, this decision isn't final—you can add other libraries later. But to help you make the right choice, let me explain how these two libraries differ. If you don't use iTunes, folder-based libraries are the right choice for you. To create one, point beaTunes to a base-folder in your file system. This can be any folder—local, remote, external—it does not matter, as long as it's visible in your file system. Usually it makes sense to choose the Music folder, but you're certainly not limited to it. Tip for OS X users: If you cannot find your external drive, try using the keyboard shortcut Command(⌘)-Shift-G and enter /Volumes. That's where external drives are usually mounted. When you have defined the base-folder, beaTunes will start adding all audio files in that folder and its sub-folders to its database. While doing so, it also imports all ID3 and other tags it can find. The process of reading external data is called Synchronization. More about that later. Once your files are scanned, beaTunes presents your library to you and you are ready to go. Starting an analysis or an inspection is a good idea. All changes will be written directly to your files. A common question that comes up is, "how do I add files to the library"? The easiest way is to add new sub-folders with audio files to your base-folder and then choose Synchronize from the File menu. Alternatively, you can also simply drag files into the beaTunes Music list. If the file is not already contained in the base-folder, a copy within in the base-folder will be created and added to the library. If you're not afraid to modify an XML file with a text editor, you can also add additional base-folders to a single, folder-based library. If you are using iTunes and expect BPM values calculated by beaTunes to show up immediately, you should create an iTunes-based library (Important: iTunes XML sharing needs to be on for this). When you do so, beaTunes will add all files you have in iTunes to its database and also scan them for additional ID3 and other tags. But more importantly, whenever you change something in beaTunes, it tells iTunes that something has changed or even asks iTunes to perform the change. This ensures that you see changes in iTunes right away without having to play a file. However, it does not mean that other programs also see changes immediately. Software like Traktor typically has to re-scan files. Also, when in iTunes-library-mode, beaTunes by default does not write certain values to your files. If you are interested in embedding non-iTunes fields like key or color into your files, make sure to check the box Embed non-iTunes fields into audio files in the general preferences before you start the analysis. This can also turn out to be useful, should beaTunes' internal database ever get corrupted, as it can then be completely restored from your files. The biggest problem in library management is dealing with external changes. If you for example mass rename all your files, beaTunes will have great trouble connecting the files under their new name to their corresponding database entry. Removing or adding songs from your iTunes library may also pose problems. This is why synchronization is needed. It's basically an attempt to synchronize the internal beaTunes database with your actual library—be it folder- or iTunes-based. To achieve this, beaTunes supports two kinds of synchronization: Automatic on window activation and manual. Automatic synchronization re-scans your library every time you switch from another program back to beaTunes. Naturally, it does not always re-read the whole library, but pays attention to certain changes. Nevertheless, this can slow down the software quite a bit. If you find that beaTunes spends a lot of time on this, it's better to turn it off. Again, this can be done in the general preferences under Synchronize on window activation. With automatic synchronization turned off, data may get out of sync at some point. Then it's time for a manual synchronization. This can easily be done with the corresponding item in the File menu. Tip: If you don't want beaTunes to work on outdated data, synchronize every time before you run an inspection. 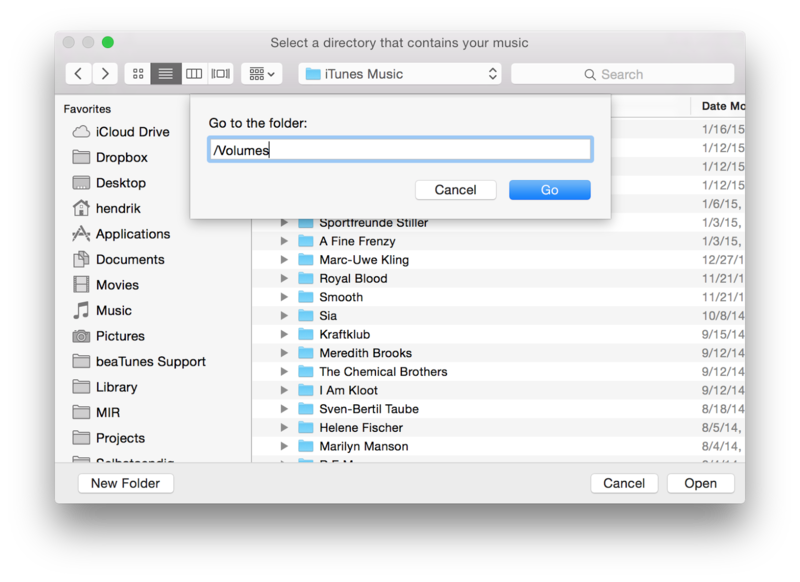 If you realize after a while that you need to switch between a folder-based and an iTunes-based library or simply want to use a different base-folder, it's time to create a new library. The easiest way to do so, is to open the File menu and select New Library.... beaTunes will ask you which kind of library you would like to create and either prompt you for a folder name or the iTunes Music Library.xml file you want to base your library on. To switch back to another library, simply open the general preferences and choose another library from the drop down list. I hope this article explained how the two kinds of libraries differ. Please comment below, if you have any questions or start a discussion in the help forum. This article is part of a small series under the heading "HowDoesItAllWork". Part 1 explains the overarching idea behind beaTunes. Part 3 takes a closer look at analysis and analysis options. Part 4 takes you step-by-step through the inspection process. Part 5 concludes this little series, showing how to build great playlists. Hello. I cant understand... I got beatunes 5. I got itunes library on external hard drive. How can i make beatunes analize that folder and everwrite file info on external hdd. I dont whant beatunes to copy my music. Please use the support forum at http://help.beatunes.com/ for such questions. Thanks!